Product prices and availability are accurate as of 2019-03-08 18:45:54 EST and are subject to change. Any price and availability information displayed on http://www.amazon.com/ at the time of purchase will apply to the purchase of this product. 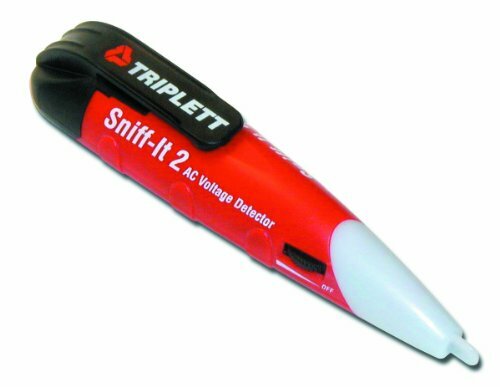 The Triplett Sniff-It 2 is a high performance AC Voltage detector with adjustable sensitivity. It offers a wide measurement range of 5 to 600 Volts AC . The ABS plastic housing provides impact and drop resistance in a sleek ergonomic design, and the easy to use thumb wheel helps dial-in detection range. The Sniff-It 2 will provide long reliable use with its industry leading warranty. Currently located in beautiful New England, Triplett has developed and produced high-quality test equipment and tools for over 100 years. They stand behind every product. If you have any questions, or need service or repair, call their Technical Support Hotline at 1-800-Triplett. Triplett always loves hearing from customers.